Emmys: Will Sterling K. Brown or Matthew Rhys Take the Lead Drama Actor Trophy? 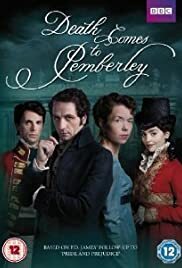 How many episodes of Death Comes to Pemberley have you seen? Q: When will this be released in the US and via what method? TV? Direct to DVD? Q: What is written in the heart and what does it mean? Firstly, I hate fanfic. My teeth start grinding after a few paragraphs, even when it's written by PD James. Secondly, if you're going to do anything with P&P you have to judge your two main casting decisions with a perfection required almost nowhere else. We all know Elizabeth and Darcy so well. So the producers of two productions which have dared to go off piste, Lost in Austen and this one, must have thought long and hard. Gemma Arterton did extremely well in Lost in Austen, a blend of period drama, summer RomCom and Dr Who, and Anna Maxwell Martin, as you might expect, is simply perfect here, in Austen meets the Poirot Christmas Special. Anna gives us the mature Elizabeth, holding court at her more informal Pemberley, with an older Darcy who has recovered all his manly confidence in personal relationships and yet is even more deeply smitten. They have a son and are clearly wonderful parents. Both characters have changed in exactly the way Austen predicted in her last chapter. Elizabeth has risen in status and now wears the authority of Mistress of Pemberley, rationally softened, like its master. They are unusually sparkly together and very reminiscent of the Netherfield scenes. This is principally down to the extremely good performances from two actors and an their understanding of their characters which goes way beyond the script. The whole cast is outstanding, the best in a period drama since Emma09 and the mystery is satisfyingly interesting. There's lots of clever 'dialogue' with the original and arch references to earlier productions (it's the 95 Pemberley). Can't wait for the next instalment, as Pemberley itself is challenged and their relationship is tested. I do hope the Bingleys, Caroline at least, turn up soon. Of course, it isn't Austen. If it hurts to think that it is, then imagine it as a 100-year prequel to Downton Abbey, 10 times better acted and 50 times better written. 28 of 64 people found this review helpful. Was this review helpful to you?